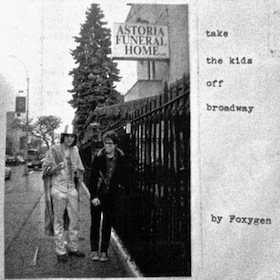 It’s not our own world in which “everyone’s talking ‘bout haircuts.” The world Foxygen inhabits – one of enigma, sudden shifts in the weather, triumph and desperation, doesn’t have time for the filler that peppers most of our lives. Here, each crescendo, synth layer, sha-bopped and aah’d harmony section are dropped with deft precision – like Jackson Pollock doing a covers set of Titian paintings. How’d you find these guys?? “Controlled chaos” is a brilliant and accurate description. Flamgirlant turned me on to this a couple of months ago, and it’s been in rotation ever since. Nice. I’ve been known to compare some of my baser works to Pollock. This almost sounds like Mick Jagger, that is, if he still made quality music. Mick Jagger comparisons are justified. Velvets too, it’s all there. And don’t worry Dominic Biermann, no one will.